This main character is a great pavement artist and takes Covert Operations in school! You can see my review here. Though it’s not fiction, I absolutely love The Spy Wore Red: My Adventures as an Undercover Agent in World War II by Aline, Countess of Romanones. I can’t recommend it enough. I loved Dragon Slippers (the first in the Dragon Slippers trilogy). Dragons, wittiness, and adventure, oh my! Just look at that tagline on the cover: She wanted dragon gold. She got a pair of shoes. My grandmother introduced these books to my mom, who introduced them to me! If you haven’t read a by book from Ann McCaffrey yet, you definitly should (though the Harper Hall Trilogy is my favorite)! Nancy Drew! A great deal of my childhood was spent reading the Nancy Drew series! Bad Kitty is filled with unique, quirky characters, laugh-out-loud lines, and a fun mystery! This was such a fun book! I loved the different locations the main character visited, and I was always excited to see what was in the next envelope! Who doesn’t love a fun road trip? My favorite book out of the series was Princess Mia (#9). Which was yours? What were your favorite books you read before blogging? Meg Cabot is the queen of fiction, her series are always so good! :) Hooray! I’m excited to see it, thanks so much for the interview! Good call with the Nancy Drew- I definitely read my share back in elementary and middle school. I loved those books, I was always excited to hear what mystery Nancy, George, and Bess discovered next! :) Thanks for stopping by & commenting! Perfect Cover was a really fun book, and I love how Ally Carter and Jennifer Lynn Barnes are great friends! :) Thanks for stopping by & commenting! Meg Cabot! <3 I read so many of her books before I was a blogger and loved them all. She's brilliant. I also love that you have Nancy Drew on your list! I was a huge fan! I love Nancy Drew, I could never resist a good detective story! :) Thanks for stopping by & commenting! Wow I love this blog…. I really mean to read 13 Little Blue Envelopes. Then I forget to do anything about it. Have you read the sequel? Thanks for visiting my blog. I did read the sequel, I think it gave a lot of closure to the story! :) Thanks for stopping by and commenting! I love the cover of Bad Kitty… going to check to see if the library has it right now! Here is my list: Top Ten Tuesday. I hope the library has it! :) Thanks for stopping by and commenting! Ooh, I love Nancy Drew!! I just got the Ghallager Girls book from the library! Very excited to finally start that series :) Bad Kitty also looks good (and How to be Bad was cute). Ahhhh Nancy Drew! I used to love Nancy Drew! Awesome list! Of all your picks, I’ve only read the Nancy Drew mystery, but it was my favorite! Good thing TTT came up with the list this week right? I haven’t read a lot of the books I’ve seen on other TTT lists this week, either! Great List! I haven’t read any of these but they all sound really good. I will have to add a few to my TBR :-) Thanks for stopping by my TTT. 13 Little Blue Envelopes is the only one I read among these books. Wasn’t totally smitten by it, though. Bad Kitty sounds interesting! I’d check it out. I recently read Dragon Slippers, and it was absolutely adorable! I love JDG, but my favorite is Sun and Mon, Ice and Snow! I actually have not read any of these! Actually, I MAY have read that Nancy Drew, because I went through a phase where I read a ton of them, but I’m not sure I could pick the ones I read out of the masses. I do want to read Ally Carter’s series (LOVE Heist Society) and JLB’s spy/cheerleader books sound fun too. Great List! I had a spy book phase in high school – but those awesome books weren’t available yet! I haven’t read most of these, but I did recently start the Gallagher Girls series and it’s loads of fun. I also used to love Nancy Drew, although I haven’t read those books in a long, long, long time! Great list! I need to read 13 Little Blue Envelopes yet still. There are just so many great books out there to be read. :-) Thanks for stopping by my list. Happy Reading! Ohhh, I love that you broke this down into different phases of reading you went through! So many interesting books. 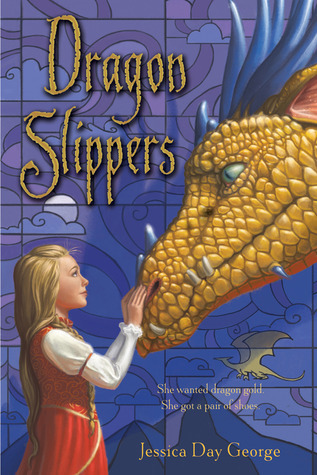 Dragon Slippers looks adorable and I want to read it right now! Thanks, I had fun making this list! :) I hope you get to read Dragon Slippers soon! The Gallagher Girl books are a guilty pleasure of mine. I also LOVE Dragon Slippers. I may own all of Jessica Day George’s books. I have to say I haven’t read single book on your list. I love the Gallagher Girls series! They’re such fun books to read. I can’t wait to read 13 Little Blue Envelopes, I love books that mention travel, and this one sounds like it’s a great book! Great picks – I also read Ally Carter’s GG books before I started blogging, and they are the best. I’ve only just heard about The Squad books and I’m SUPER excited to read them. Thanks for sharing and for stopping by my TTT! The only book I’ve read it 13 Little Blue Envelopes. I like it, but I actually liked the second book way better. I haven’t read the first one for a while, though, so I don’t know. I own I’d Tell You I Love You, But Then I’d Have to Kill You but I STILL haven’t read it. I need to do that soon. I hope you love it when you read it! :) The 1st book is great to get background on the characters, but the plot arc of the series doesn’t really start until the 2nd/3rd book. Love how you broke them out into your phases! i definitely read like that sometimes, where I can’t get enough of one type of book! Also, Dragonsong… can I just say how much I loved these books when I was younger?! Great list! Great list! I need to read 13 Little Blue Envelopes yet. Great List. :) Thanks for coming by my Top Ten. :) Happy Reading! Ah! I haven’t read any of these! I’m thinking a trip over to GoodReads is in order after this comment. I love the Airhead trilogy! It’s probably my most favorite series by Meg Cabot ever. Thanks for commenting on my blog. I enjoyed your list. I liked the phases and we have similiar taste in many books since I also read and enjoyed them! I believe the last Gallagher Girl book comes out this year so I’m totally going to binge read then. I already love the Heist Society series. I love binge reading series; it’s been awful waiting so many years for the GG series! Yay Gallagher Girls! I found them after blogging, not before, but I still adore them. I actually have not read a single one of these! I adore Maureen Johnson’s twitter account and she is an author I reallllllllly need to be checking out. I was never a Nancy Drew fan, but I LOVED the Hardy boys and some other similar series about 3 boys who solved mysteries. I loved the mystery, I was so addicted to the story. I have a massive amount of love for Nancy Drew. My friends and I read practically every single one of her books when we were in elementary/middle school. Such good memories! Okay, I have the same problem as you. I don’t know what to comment on because there’s just so much! I love all the phases you put, so creative and I adore that! I now added lots on my TBR because hello, cheerleader spy? I’m intrigued. Ally Carter and Meg Cabot, check and check. The others? I’ll be checking out ASAP. I haven’t read any of these, but going to have to check out The Spy Wore Red as it sounds really interesting! Oh great choices! Loved How to Be Bad and 13 Little Blue Envelopes! !